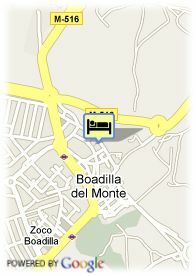 Plaza De La Concordia, s/n, 28660 Boadilla Del Monte, Spanien. 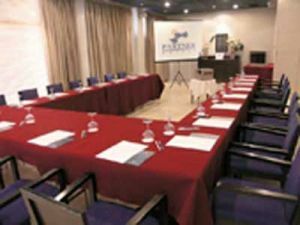 Hotel Partner Boadilla Palacio is located in the centre of Boadilla del monte, a 3 minutes walking from Infante Don Luis Palace, and only 20 minutes from the centre of Madrid. It offers 36 comfortable rooms in three floors, the first and second floor house 24 spacious apartments with lounge, 12 studios with terrace are located on the third floor and it also has restaurant, café, business corner and garage. Bezahltes überdachter Parkplätze beim Hotel (10.70 €). ältere Kinder und Erwachsene: 35.31 € pro zusätzliches Bett.